Battery powered Nerf machine guns, some hate them, others love them. Those who don’t like them say that they ruin the true Nerf gun vibe and those who do like to shoot around with Nerf machine guns argue that it adds a welcome variety to the full Nerf range of blasters. We are somewhere in the middle, although we do have a slight preference for old-school, non-electronic Nerf blasters when we do our battles. That said, battery powered blasters can be lots of fun to play around with. That’s why we’ve had a look at all Nerf machine guns ever made and have selected the best ones for you. They should still be available for purchase today. Should you get yourself a conventional or a battery operated Nerf blaster? Or maybe both? A machine gun is typically more expensive than a manually operated one. This is because machine guns are technically much more complicated to manufacture. The price difference can be quite significant so it’s up to you whether you think it’s worth the extra investment. In addition, they require batteries which also costs money. Nerf machine guns are also a bit heavier than normal guns. So for younger kids this may become a bit of an issue. What’s good about battery operated blasters is that you can focus more on accuracy. There is no need for manual prime movements so you can hold your arms nice and still. Be mindful though that Nerf guns have never been famous for their amazing accuracy so don’t expect too much. And of course, the firing rate typically is a lot higher which is a lot of fun. So to answer the question at the start of this paragraph, we recommend you get both types of Nerf blasters. Or get a blaster that can be used as a machine gun and also as a manual gun. They are fundamentally different ways of operating a Nerf blaster, so we think it’s best to experience both. When looking for a Nerf machine gun, you’ll come across quite a few fancy terms. Let us explain the most common ones so you can get a better understanding of what these blasters can and cannot do. A Nerf blaster is considered full automatic when it fires multiple shots with only one trigger pull. Multiple shots get fired by holding down the trigger. Full automatic Nerf guns generally have the highest firing rate, but you also run out of darts quicker. Semi automatic means that only one shot is fired with one trigger pull. It’s still considered auto because there is no need for any extra manual movement, such as priming, to shoot. The firing rate is lower but you don’t have to re-load as much. Semi automatic Nerf blasters are usually also slightly cheaper than full automatic ones because they are less complicated. The flywheel system was introduced as an alternative to the manual priming process. The flywheel is an internal component in electronic blasters that makes auto and semi auto firing possible by essentially automating the priming movement. This is our list of 6 awesome battery powered Nerf machine guns that you can currently buy. 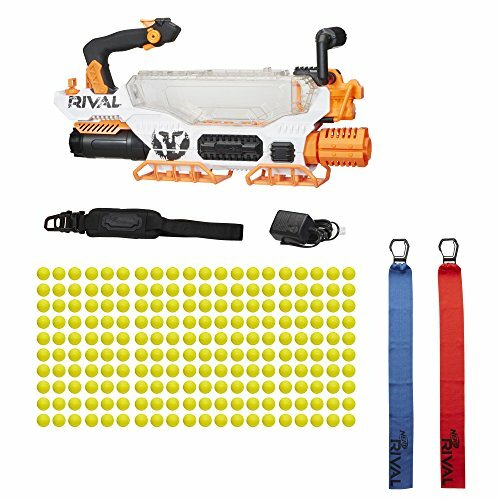 First introduced in the second half of 2017, the Nerf RIVAL Nemesis is a revolutionary Nerf blaster with strongly improved performance and unique design and look-and-feel. RIVAL blasters shoot with foam balls, otherwise known as high-impact rounds. RIVAL blasters are marketed towards older children (ages 12 and up). These blasters are quite heavy and a lot more powerful than classic Nerf guns. The Nemesis is a very powerful, fully automatic Nerf blaster that comes with a gravity fed hopper system that can hold 100 rounds. The hopper is an entirely new type of Nerf ammunition holder and works well. It works based on gravity so you can’t hold the blaster upside down. You may also sometimes need to shake the blaster a bit in order to feed the balls into the internal conveyor system. The Nemesis requires 6 D-type batteries. Alternatively, Nerf has designed a rechargeable battery pack specifically for the RIVAL blasters. This pack is one big battery that you can keep recharging with a wall charger. The Nerf RIVAL rechargeable battery pack is recommended over the D-type batteries because in the long run it will save you money. 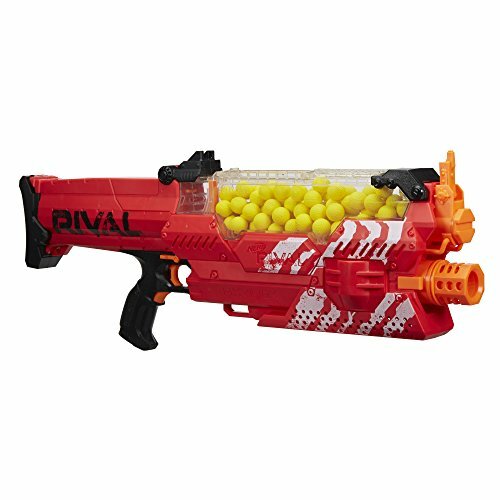 The RIVAL Nemesis is a phenomenal Nerf blaster that is lots of fun to shoot with. 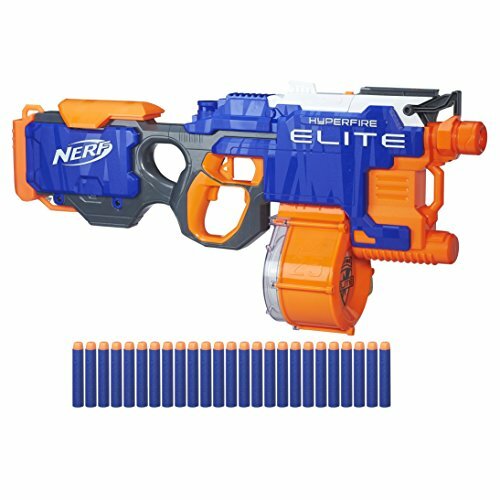 The 2016 N-Strike Elite Hyperfire is a fully automatic Nerf blaster that comes with a 25 dart drum and can achieve a very impressive 5 darts per second firing rate. The Hyperfire does have the right looks with a great color scheme, but it’s not the most ergonomic Nerf gun ever made. The low grip at the front of this model is a bit weird, although some may actually like it. The jam door cannot be fully opened which makes it harder to fix jamming issues. All Nerf blasters will jam at some point so this could lead to a bit of frustration. The best thing about the Hyperfire is the huge dart drum that holds 25 Elite Darts. The 5 darts per second firing rate makes for an exciting firing experience. Overall this is a really fun blaster at a very competitive price. 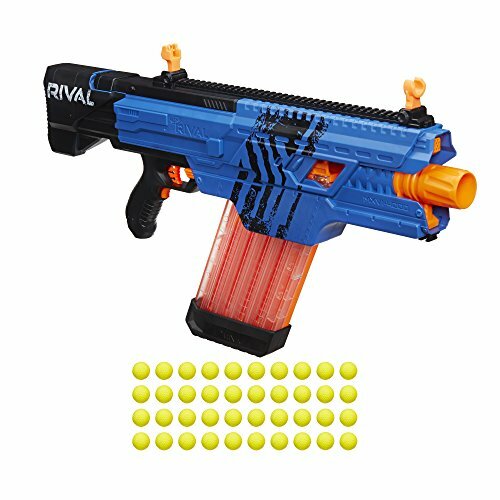 The rather large Nerf Khaos in the RIVAL series is a fully automatic, flywheel operated blaster with a 40 round magazine. As with all blasters in the RIVAL series, the Khaos shoots Nerf RIVAL rounds, not darts. While re-loading your average Nerf gun is usually a breeze, loading the magazine in the Khaos is actually quite a unique undertaking. You’d have to fiddle around a bit with hatches, buttons and slides to get the 40 balls loaded into the magazine. Not a showstopper by any means, it’s just a bit different. The Khaos requires 6 D-type batteries to operate. Yes, those big, heavy expensive ones. But just like with the Nemesis, it’s recommended you buy the very efficient Nerf RIVAL rechargeable battery pack. The Khaos is a cool blaster, targeted at a more mature market. RIVAL blasters shoot quite hard and they are a bit on the heavy side, so they are not really suitable for smaller children. The automatic firing mechanism works really well with pretty good accuracy. 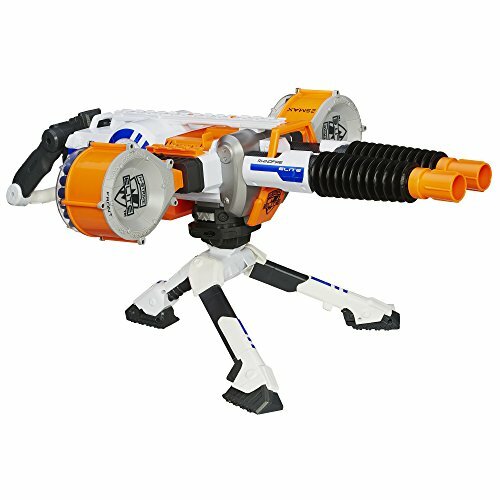 First released in 2016, the Nerf Mastodon is part of the popular Mega range of blasters, a sub series of the N-Strike Elite range. The N-Strike Mega Series is characterized by superior firing range using the larger Mega darts. 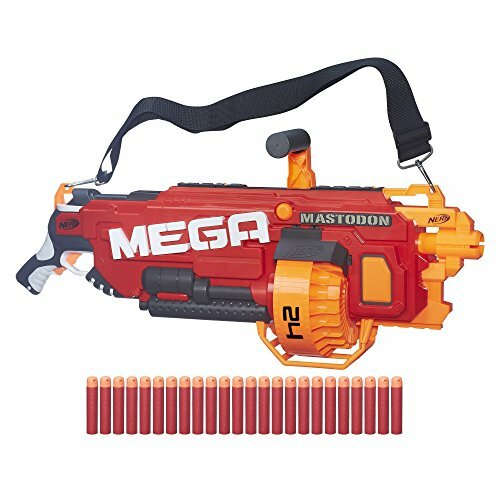 The Mastodon is a full automatic, flywheel operated, motorized blaster that comes with a rotating drum that hold 24 Mega darts. An added bonus is that you can also fire single shots with this blaster. So essentially it’s a semi and full automatic blaster in one. Similar to the RIVAL Khaos, this machine is rather BIG and heavy, especially with the 6 D-type batteries that it needs. In other words, this blaster is not the most suitable for small kids. Overall this is a really cool blaster though, with excellent firing range. The shoulder strap is a cool accessory to make this blaster look and feel like a real chainsaw style machine gun. The Rhino-Fire is a classic Nerf blaster in the N-Strike Elite series, released in 2014. Equipped with a tripod, a double twenty-five dart drum and 50 Elite darts, the intimidating Rhino-Fire is a fully automatic, flywheel operated blaster that can fire from both drums simultaneously. You can hold this blaster manually with the grips at the back or the handle on top, or you can simply use the tripod and place it on a surface. This blaster is a lot of fun to play around with, but it’s definitely not the most ergonomic or practical Nerf blaster. It also wouldn’t be the most suitable blaster for Nerf battles either. It’s just a fun and unique Nerf machine gun to add to your collection. As the newest Nerf blaster in this list, released in the fall of 2018, the Nerf RIVAL Prometheus is an impressive shoulder slung machine gun. This blaster is considered to be the replacement for the Nerf RIVAL Nemesis we discussed earlier in this list. The Prometheus is a big, heavy, powerful machine gun. holding up to 200 high impact Nerf balls in its gravity fed detachable hopper, you can decimate your foes with insane firing speeds of up to 8 balls per second! This short lived mayhem is much more fun than the unavoidable pain of collecting all the balls. You'll want to plan your battle accordingly. Included in the box is a 9.6volt NiMh rechargeable battery, 200 Nerf High Impact rounds, charging cable, shoulder strap, and a blue and red team flag. While the team flags don't seem to serve much purpose but it is nice to see a rechargeable battery included! Overall this blaster is well suited for a one time barrage of your foe(s) unless you plan on carrying extra ammo. Its lack of mobility will make things harder to use for younger kids as well. negatives aside, its an impressive piece of Nerf technology.